Did the EPO just get itself a ‘younger Battistelli’? REMEMBER the judge from Italy who wanted to become the President of the EPO? We really feel for him. He probably didn’t know that the next President of the EPO had already been chosen. The purpose of another candidate was only to give an illusion of choice or a selection process. We have been following this closely for months and for a long time there was no eligible application from anyone other than António Campinos (other applications got rejected outright). At some stage, towards the very end, we became aware of only another application. But there was no doubt in our minds António Campinos would get the job, knowing (and hearing) what Battistelli had been doing behind the scenes. “Maybe it’s time for this Italian judge to consider an ICC investigation. He did, after all, come from ICC.”The culture of nepotism at the EPO is a serious cancer. Just watch the spectacular rise, for example, of Elodie Bergot and her husband, a longtime Battistelli ally (from INPI). We wrote a lot about that. The EPO’s recruitment process has become best known for tailoring job requirements for particular people — a classic nepotist’s trick. 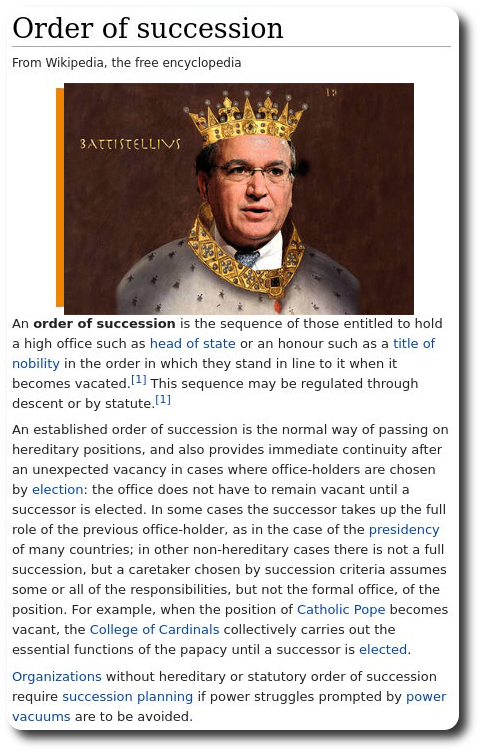 Battistelli lobbied countries to help rig the ‘crowning’ process. Why should EPO staff be quiet about it and tolerate any of this? Maybe it’s time for this Italian judge to consider an ICC investigation. He did, after all, come from ICC. Immunity probably isn’t much of a barrier to ICC, which itself enjoys immunity. “Is Battistelli going to be to the EPO what Henry Kissinger became to the US government? In other words, is only Battistelli being ejected but not Battistelli-ism?”Consider again Monika Ermert's articles about the EPO scandals (she published articles about Ernst's first chairmanship opportunity over the past few days at IP Watch and Heise). Here is her Heise article about António Campinos, which SUEPO has just translated into English [PDF] (and French too). It’s useful (especially the latter parts) because it confirms what we reported as rumours several months back. António Campinos in his role as Director of the European Union Intellectual Property Office 2013 in Bangkok. Boss of the European Patent Office, Benoît Battistelli, is going. During his time in office some of his staff had dubbed him the Sun King – more of a reign. Maybe António Campinos, a Portuguese, can calm things down at the EPO. Former chief executive of the Portuguese Patent Office, António Campinos will be the new boss of the European Patent Office. As the Munich-based authority revealed today, Wednesday, the 38 members of the EPO Administrative Council elected Campinos at their meeting directly at the first vote. Campinos is not heir to an easy throne. Campinos is due to succeed Battistelli on 1 July 2018, whose second term in office which is limited to three years will then terminate in the proper manner, according to the EPO. Still ruling President of the EPO, over the past few years Benoît Battistelli has made some bitter enemies in his own institution due to a rigorous policy of economy measures and a contentious routine of monitoring his staff. He dismissed employees from the ranks of the in-house staff union Suepo who demonstrated their willingness to strike. Some of these have since then lodged proceedings before the European Court of Human Rights in support of their right to strike. At the end of last year Battistelli even fired the chief staff representative at The Hague. Campinos will be the first person representing a southern European country to head the EPO. As former chief executive of the Portuguese Patent Office he is a proven expert in the field, and was well known to the members of the Administrative Council after representing Portugal on the Council for a number of years. Campinos’s present job as Managing Director of the European Union Intellectual Property Office (EUIPO) was plainly viewed by the EPO Administrative Council as proof of his qualifications to lead an international authority. This was lacking with the only other candidate, a judge put up for the position by Italy. Initially Campinos had had no competition at all. Battistelli himself is no longer standing for election. The EPO is emphasising above all the smoothness of the election and the seamless handover of the reins of office in the summer. By contrast, before Battistelli was elected in 2009/2010, the Member States on the Administrative Council were for months unable to agree on a candidate. At the same time, JUVE, the publishing house for legal information, was reporting on mixed feeling among the members in the light of Campinos’s election. Some of them are afraid that Campinos is too close to Battistelli, who rapturously congratulated his successor. Nevertheless, “some of the Administrative Council clearly trust” Campinos “to resolve the conflicts with some of the staff and with the unions”, so say the experts.